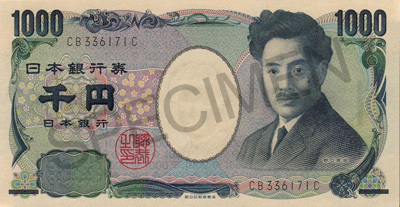 This is the original 1,000 Japanese yen note. I wonder if it will work on Yusof Bin Ishak, since the position of the portrait is pretty close. Perhaps it may even work on Benjamin Franklin with some change to the technique. I guess some get it lucky without having to do anything. Other than the turban technique, Mr. Nakajima also came up with other techniques to outfit Noguchi with different headgears. Sombrero and a veil are two of them. 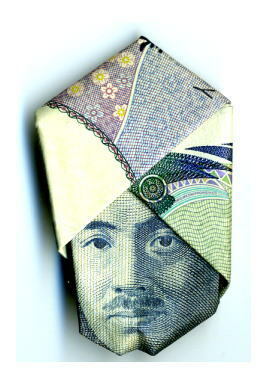 If you wish to try these origami techniques, do visit Pink Tentacle for the original article that also links to Turban Noguchi No Sekai 「ターバン野口の世界 「ターバンのぐちのせかい」」 which also means “The World of Turban Noguchi”. Featured on that site are the many incarnations of Hideyo Noguchi and a YouTube video on how to fold your very own “Turban Noguchi”. LOL! The last currency’s a classic! Hahah! This is interesting! I think it’d work on our notes because the positioning of the person is in the same area? I think hell notes come in brighter shades of blue and red. I’ve not offered those in years. The ones I can remember are the supposed ‘coins’. The sheets with shiny center material in the center where you’re supposed to fold into taels before burning.